The Seattle School superintendent’s final recommendations for school closure and relocation have just been posted at the District’s website. There have been some slight modifications, but the effects on Southeast Seattle are fairly similar to what’s been proposed all along. NOVA and SBOC will be moving to Meany, and Summit K-12 is still recommended for closure. A motion on these recommendations will be introduced to the school board at their meeting tomorrow, January 7. The board will then vote on the plan on January 29. In the meantime, there are two public hearings planned, one at Lowell, 1058 E. Mercer Street, at 6:30–8:30 pm on January 20, and one at the school district headquarters in Sodo, the John Stanford Center for Educational Excellence, 2445 3rd Avenue South, at 6:30–8:30 pm on January 22. To testify, you must be added to the list in advance. Email hearing@seattleschools.org or call 206-252-0042 to do this. You can also express your opinion by emailing comments to capacity@seattleschools.org or schoolboard@seattleschools.org, calling the School Board at 206-252-0040, or mailing comments to School Board, PO Box 34165, MS 11-010, Seattle, WA, 98124-1165. While we are quite skeptical (to say the least) about the value of online petitions, we don’t mind spreading the word so you can make your own decision whether to sign. Over 1,000 people have signed so far. Seattle Schools superintendent Maria Goodloe-Johnson will announce the final school closure and relocation plan this afternoon. 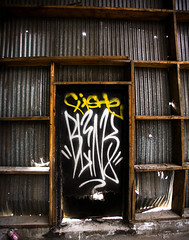 Seattle graffiti. Photo by Philo Nordlund. KUOW FM recently ran a report on the school closure horse trading involving Arbor Heights, Cooper, and Rainier Beach High School, as reported by Sable Verity and also discussed in the Rainier Valley Post. KUOW’s transcript is here. And speaking of KUOW and school closures, they mentioned in our comments the other day that Weekday is featuring the school closure debate today from 9:00-10:00 am with Superintendent Maria Goodloe-Johnson and School Board member Michael DeBell among the panelists. KUOW is at 94.9 FM. You can call the show at (800) 289-KUOW or email weekday@kuow.org. 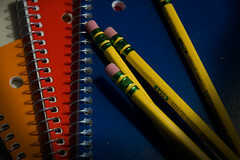 High-poverty schools “sacrificial lambs” in school closures? 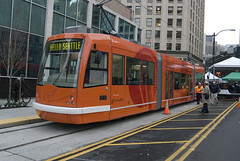 Seattle streetcar, soon to link the ID to Broadway. Photo from Seattle Municipal Archives. Among all the school closure craziness going on, we missed that there is a community meeting scheduled tonight (“to hear questions and concerns from our school community”) at the African-American Academy, 8311 Beacon Avenue South, 5:30 – 7:30 pm. Tonight there are also meetings for Madrona K-8 (4:30 – 5:30 pm), Summit K-12 @ Jane Addams (6:00 – 8:00 pm), and Thurgood Marshall Elementary (6:00 – 7:00 pm). Keep tabs on this school district page to see if any new meetings or hearings are scheduled. Things seem to be changing rapidly in this process.